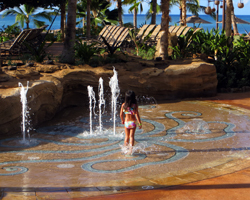 Aulani Resort Brings Disney Magic to Your Hawaii Vacation. 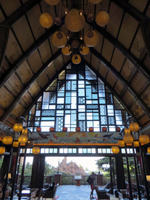 Aulani Resort: Disney Magic for Your Hawaii Vacation! 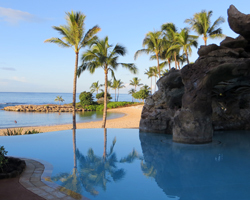 Check Rates and Availability at (ad) Hotels.com : search keyword "Aulani" (link opens a new window/tab). 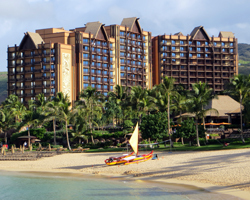 There are many fantastic Hawaii vacation resorts; but the Disney Aulani Hotel in the Ko Olina Resort area of West Oahu is the only one designed and built to enchant their guests like only the Disney imagineers know how. Throughout my life, I’ve been to Disneyland at least 16 or 17 times. Most recently, my family stayed at the Grand Californian Hotel, which is expensive and worth every penny! So I definitely appreciate Disney magic. 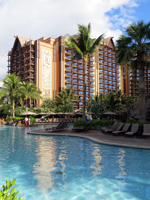 Having now experienced a staycation at Disney’s Oahu resort (a family Christmas present), I can confidently say the magic isn’t limited only to the theme parks. Why would someone would fly right past Disneyland – the second happiest place on earth (behind Hawaii) – to pay a comparable price for the Aulani without the added incentive of getting to go through the Haunted Mansion or sail with the Pirates of the Caribbean? That just didn't make sense to me. Don’t get me wrong… I fully understand the hundreds of reasons why people want to come to Hawaii. That’s why I’m creating this site. But Disney has never been synonymous with Hawaii. In fact, I always found it a bit embarrassing that the alien, Stitch, is the only Hawaii character in the Disney cast. Weird. You’ll see it in the architecture, the artwork, the accommodations, the activities, and (alliteration ends here…) the grounds. 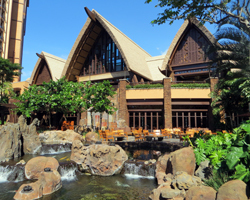 The hotel itself is designed to look like a cluster of thatched huts – inside and out. And seemingly every square inch of the property is covered with Hawaiian-themed art and exhibits. 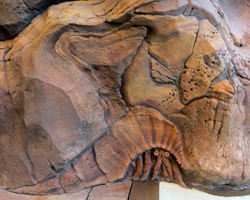 The exterior of each building section is impressively illustrated with what looks like tribal tattoo designs, Hawaiian petroglyphs, and larger-than-life wood-block kapa/tapa prints. 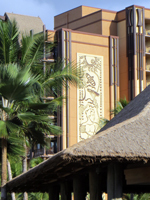 Many of the interior walls are painted with murals or hung with various Hawaiian artifacts (as well as some distinctly Disney artifacts). And there are carved tiki statues and surfboards throughout the property. 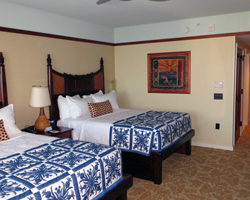 Having now stayed in one of the Aulani guest rooms, I can tell you they are spacious and comfortable. My friend Dave usually stays in the one-bedroom suites, which come complete with a kitchen. But my wife wanted to get away from chores like cooking, so we booked a standard garden view room and got lucky when we were given a free upgrade to an ocean view room. It was awesome! And even the standard rooms have a refrigerator. This hotel is not cheap. But neither is Disneyland. You pay to have fun, and you get your money’s worth. That's fair. 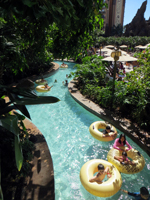 Aulani is designed such that the guest room towers form a “valley” – complete with a lazy river for inner-tubing, a volcano for lava tube water slides, a water playground for small children, a snorkeling pool that’s packed with exotic tropical reef fish, and swimming pools everywhere! 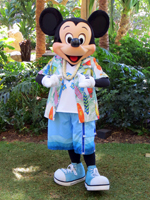 First of all, you get the iconic “A-list” characters: Mickey, Minnie, Donald, Goofy, Chip and Dale (in their Hawaiian resort wear, of course). But you also get almost non-stop opportunities to meet and greet them throughout the day! 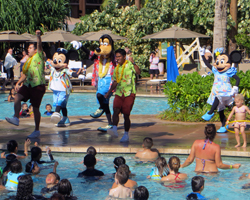 They’re either posing for pictures next to the lazy river; or they’re greeting diners and performing a show during the character breakfast; or they’re out playing with everybody at poolside in the middle of the day! And let’s talk about that Character Breakfast at Makahiki Restaurant a bit more… I’ve had the character breakfast at the Disneyland Grand Californian Hotel twice before, and this was better! Yeah, they still have the Mickey Mouse waffles (and Stitch). But they have so much more. In addition to the traditional U.S. mainland breakfast fare, they also have favorite foods from Hawaii and Asia. 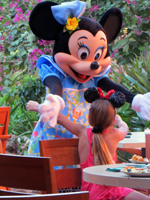 And not only do you get table visits from the most famous characters, but they also put on a show with singing, dancing and children’s activities. The “A-L-O-H-A” song will stick in your head as bad as the “It’s a Small World” tune does at Disneyland. The character breakfast is hosted by “Auntie” (from the Auntie’s Beach House child play area) who has potential to become a superstar Disney character in her own right. She’s a fantastic entertainer; and I think Disney would be foolish not to create a role for her in their rumored next animated film about Hawaii. After stuffing ourselves at the buffet and before we spent another six hours in the pools, we needed to let things digest for a bit. 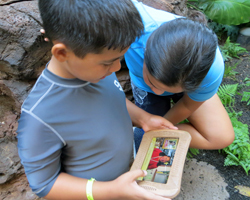 As it turns out, that was a great time to participate in one of the electronic interactive scavenger hunts created to help you discover the magic of Aulani. 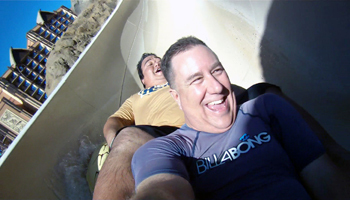 There are two different tours – outdoor and in – and it took us more than an hour to complete only part of the outdoor adventure. At that point we were hot and tired from running back and forth throughout the “valley”, and it was time to get in the pools again! Perfect! As if all that’s not enough to keep you busy, the Disney imagineers also created hundreds of things for you to see and appreciate. 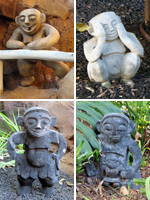 Have you ever heard of Hawaii’s legendary menehune? I’ve been told that there are at least 300 of these magical, mischievous little people throughout the property (though I’ve found only about 100 of them). It may just appear to be freshly-cooled lava, but maybe you’ll notice a giant octopus climbing across the top of the volcano. Perhaps you’ll stop to take a picture of your child in the pool and realize your towel is resting on a turtle. 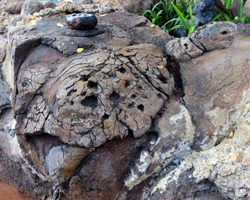 How many of the various reef fish, jellyfish, geckos, sea horses, seals, and crabs can you find disguised in the scenery? They’re all hiding in plain sight somewhere. Those pillars of water erupting from the volcano… they’re actually blow spouts from some cleverly camouflaged humpback whales. So be sure you make it a point to look at your surroundings and enjoy them all the more! Furthermore, the wonder doesn’t end when the sun goes down…. 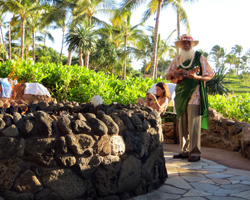 Two or three times per evening, you can gather your family around the campfire for Hawaiian legends and lore as revealed by a talented storyteller called “Uncle”. Then take in a show and enjoy the distinctively Disney brand of awesome entertainment… On Mondays and Thursdays, you can see a live hula show. On Tuesdays and Fridays, watch your favorite Disney movies out on the lawn. And on Wednesdays and Sundays, go see the stars, literally, when you look through one of the Aulani Hotel’s on-site telescopes. But that’s not the only way you can see constellations. 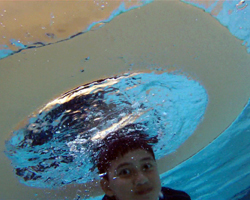 Take a look – not up in the sky, but down in the swimming pools – where lights have been arranged to mirror the night sky. And perhaps I’m just easily impressed, but one of the coolest Disney effects I discovered was the system of luminaries lining the paths and pools of the grounds. 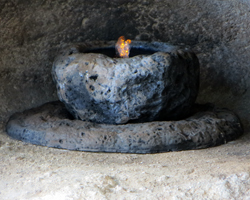 They look like candles, but they’re really miniature water fountains lit to look like flames. Very cool. 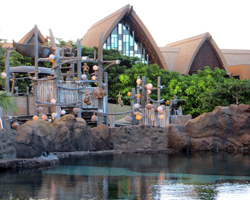 Located to the west of Pearl Harbor, the Disney Aulani Resort is fairly isolated from many of the most popular Oahu Hawaii activities (as out-of-the-way as things can get on a fairly small island). 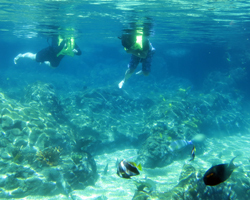 It’s approximately 45 km (28 miles) from the famous Waikiki Beach Resorts. But that’s not necessarily a bad thing, unless you wanted to spend all of your time doing recreational Hawaii attractions in Waikiki. The only nearby Oahu tourism activities that come to mind are the Ko Olina Lagoons, the Ko Olina Golf Club (and half a dozen other Hawaii golf courses), a few of the popular nightly luau experiences, the Hawaii water park, Waikele Premium Outlets, Plantation Village, and the old Hawaii railroad. Dining options are also fairly limited beyond the resort itself. My friend Dave says you really need to stay at the Aulani Resort for approximately five days to get maximum enjoyment from it. After that, he recommends looking for cheap Hawaii hotel deals at another property where you can spend less money and time while you get out and enjoy the rest of the island. I agree that splitting your time between hotels will give you the best of both worlds – and the duration at each is up to you and your wallet. Check my Hawaii hotels pages for all the various discount hotels.